One fateful week in June 1967 redrew the map of the Middle East. Fifty years later, Israel continues to face numerous existential threats. Experience an inspiring and thrilling account of what was then considered the most improbable and astonishing victory in all of military history. 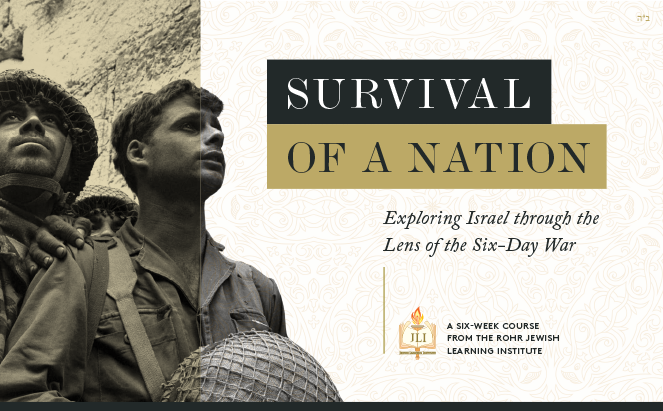 Drawing on ideas of great Jewish writers and thinkers from throughout the ages, Survival of a Nation presents the Six-Day War as you’ve never experienced it before. Its six sessions confront the impossible yet important questions of our time with affectionate and fervent patriotism, while also remaining realistic, and morally anchored. This spellbinding course will sweep you up in its narrative force and abiding love for our nation’s history and the best of its traditions, and will not let go of you until it’s done. If Judaism is a religion of ideas, why do Jews care so much about land? Why does Israel perpetually raise the ire of the entire world? What are the ethics of preemptive strikes and collateral damage? How should Israel protect itself against an enemy that hides behind human shields? What should Israel do with territories captured during the Six-Day War? What lies at the heart of the land-for-peace debate?